Many guests prefer a traditional American breakfast, and we aim to please. We will offer the meals described below as part of our standard menu or upon request. 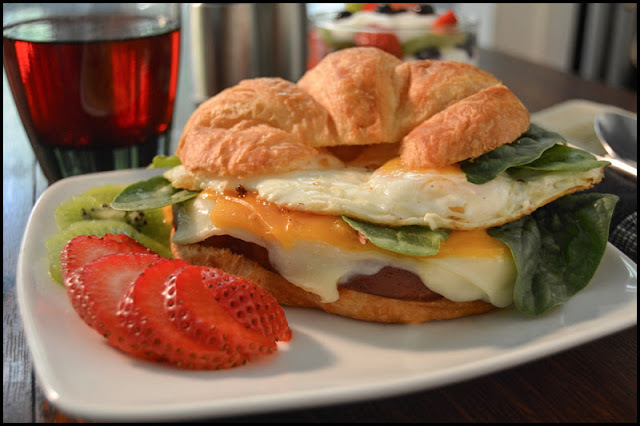 Various breakfast sandwiches will be on the mid-week menu, and there will also be weekend options. Here are a few of the dishes that will be available and that we hope you will enjoy. Breakfast Croissant Sandwich - Eggs over easy, country ham, mozzarella and cheddar cheeses, spinach, on fresh croissant. Strawberry, blueberry, and kiwi, yogurt parfait. Cranberry juice. Strawberry and kiwi garnish.